Our sample performance evaluations templates pave the way for leaders to conduct quality discussion with their employees. Using quality language during the discussion will ensure a more positive experience for both the employee and supervisor. It is the responsibility of every manager to carefully consider how you will communicate key messages d during the annual performance review. 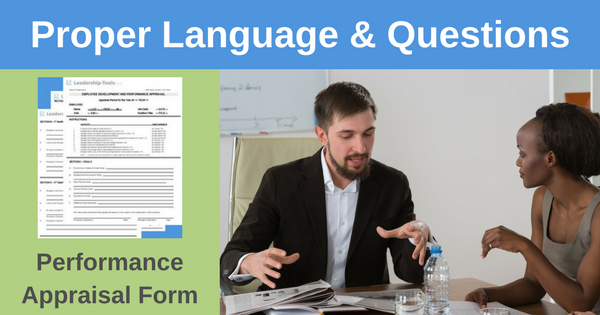 Good leaders wanting to get the most out of performance evaluations will utilize a form that encourages the proper use of words or language. The employee appraisal process can be a truly powerful activity for all parties involved, but in order to fully leverage this activity you'll need to invest sufficient time and effort to craft your primary messages in a thoughtful manner. Managers must ensure that they use language that supports the discussion. The use of language might vary depending on the individual employee as some respond better to a more direct approach, while others will require a more diplomatic or tactful approach. The main point is that you must choose your words carefully to ensure you do not unintentionally offend the employee. Naturally, some people are more secure in receiving feedback than others so you'll want to be aware of potential sensitivities in advance and plan accordingly. Avoid vague, opinionated or judgmental comments. This will only place the employee on the defensive, and is a mis-use of your authority. You do not want to offend, you simply want to help the employee to see the value in changing and improving their behavior or performance. Make sure to comment on every goal, expected behavior and performance factor. Just giving a rating is not enough. Provide some concrete examples as to how you came to your conclusion and take the time to learn from the employee how they achieved such great results, or how they think they can work to improve in this area going forward. Choose specific examples for each behavioral or performance expectation. The employee may not be comfortable in asking you to define your expectations for a certain task or category, so be proactive in explaining your preferred approach to key tasks and your expected outcome. Elaborate, provide more details for especially high or low ratings. Give the employee a good sense of how you came to your conclusion. After delivering each rating, ask the employee if he or she feels the rating is fair based on your explanation. If not, circle back and address any outstanding questions. Be open to changing the rating if the employee can make a good case for doing so. Always ask the employee what you can do better to help them be successful. This shows the employee that you are committed to their success and that you are both in this together. The performance review must be a time when open communication exists and the employee is encouraged to speak up about how he feels his daily work life and career are progressing. Quality communication requires two willing participants engaged in discussion that is focused on achieving the same goal for the team and the organization - but, it's the leader who needs to set the overall tone and example. "I would have worked a lot harder last year if I would have known that it mattered." These are examples of statements to avoid when using our sample performance evaluations. You will notice that each statement contains a personal judgment. You dress inappropriately. (Just state facts, I.e, number of times dress did not meet standards and you already spoke to the employee on each of those days. Remember, there should be NO SURPRISED during an annual review. Tracy, you have successfully planned, organized and developed the phone center by the stated completion date of 1-4-17. All supplies and equipment have been ordered on time and in an appropriate quantity, staying well below the stated budget. In addition, I'm most impressed that you have trained other team members effectively and the team is now taking 30 more calls per hour, achieving well above the projected goal. Ken, as we've previously discussed, you had four separate cash outages during the year. Two of the four cash outages were found, leaving total outages for the year at $106.30. While the total number of outages are within goal, the total amount of the outages are below your annual goal of $75. Although you earned a below average rating in the loss category, I also recognize that you've stepped up and taken on several additional side tasks (balancing coin machine, food stamps, cash advances, and more). As a result, the rating in the loss category will not impact your overall rating of Above Average. Jessie, you are consistently smiling, using a pleasant tone on the phone and always calling our customers by name. You demonstrate very good listening skills, which is how you effectively able to resolve what could have been a serious issue for one of our most valuable clients. You have received numerous customer feedback surveys praising your customer service skills. In addition, you work well with your co-workers as evidenced by their multiple accolades and words of appreciation during our team meetings. You are also quick to share best practices with the team in an effort to help your peers be successful. As a result, you've become the go-to trainer of our new team members. Notice that in each of the above example, we are writing in first person. This makes the text more personal, like you are actually talking to, not reporting on, the employee. Tone and context make all the difference. "An ounce of performance, is worth pounds of promises." Proper questioning is very important to support a quality discussion. Questions should be prepared in advance and should be structured to facilitate open and honest discussion. 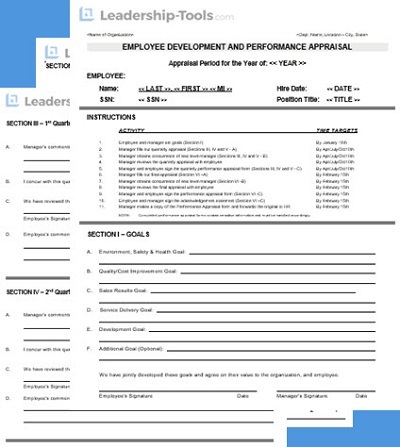 Managers need to use quality tools (such as our sample performance evaluations template) to maintain a healthy balance between giving instruction or defining expectations, and seeking feedback and listening in order to learn what is truly motivating to the employee. What do you consider to be your most important achievements in the past year? Why are these important to you, the team, and the organization? What elements of your job interest you the most? How might this area lead into other areas of the organization? What do you consider to be the most important tasks for the coming year? How do these tasks support your individual goals and the team objectives? Tell me more about that? Can you give me an example? Help me understand this piece better. What do you know about that? Do you have any ideas for improving ____________? If you had your preference, and we could stay under budget, what would you recommend? What do you think might have caused that to happen? How can we make sure to avoid it from happening again in the future? Using this type of questioning, the employee will become more involved in their own performance evaluation – and that is what a true leader is working to achieve. The key is create dialogue that is rooted in specific facts on the ground. The performance review must be a time when open communication exists and the employee is encouraged to speak about how he feels his everyday work life and overall career are progressing. Your employees are your company’s future. Their success (or failure) is your success (or failure). Using either of the sample performance evaluations provided below, now is a terrific time to connect with your employees and investigate how bright their future can be. The fourth topic in our six-part series on sample performance evaluations will address the critical issue of Being Well Prepared for the employee appraisal discussion. Great leaders already have a pretty good idea of how the discussion will go before they invite an employee into their office because they are well prepared and have a strong knowledge of the key point they wish to make. To download our free sample Performance Evaluations, simply subscribe to our free newsletter. You will immediately receive a password that grants access to our entire leadership tools library. In addition, as we researched other sample performance evaluations templates we discovered an alternative appraisal form that you may wish to consider, which you can access at Businessballs.com.